For reasons that I never quite understand, some books that I purchase end up sitting on my shelf, unread, for months or even years. Typically, when I come back to read them, I end up mentally kicking myself for avoiding them for so long. Such is the case with The Club Dumas, the 1993 novel by Spanish author Arturo Pérez-Reverte, that I finished reading the other day. I first learned of this book by watching its 1999 film adaptation, The Ninth Gate, starring Johnny Depp and directed by Roman Polanski. The movie has its charms, but pales in comparison to the clever mystery-mixed-with-subtle-horror crafted by Pérez-Reverte. The novel follows the path of Lucas Corso, a cynical “mercenary” book-dealer, as he travels across Europe attempting to uncover the mysteries of two antique books that seem to have intertwined fates. The first of these is a previously unknown early draft of a chapter of Alexandre Dumas’ classic novel, The Three Musketeers, written in serial form in 1844. Corso is tasked by his old friend, Flavio La Ponte, to verify the authenticity of the chapter. The second book is much more sinister, and in fact is three copies of the same book: De Umbrarum Regni Novem Portis (The Book of the Nine Doors of the Kingdom of Shadows), printed in 1666 by Aristide Torchia, who was burned at the stake for the act. The book, allegedly adapted from an earlier and more ancient tome, is said to contain a secret code for summoning the Devil. Corso is hired by wealthy bibliophile Varo Borja to compare the three known copies of The Nine Doors, the one held by Borja as well as copies in Portugal and France. As soon as Corso begins his parallel quests, he finds himself in the midst of intrigue that he cannot understand. He finds himself dogged by murder, pursued and attacked by strange characters reminiscent of Dumas’ novel, and aided by a mysterious young woman named after Sherlock Holmes’ female nemesis. As the mystery and the danger grows, Corso unravels the secrets of the two manuscripts and their connections. Will he be able to solve the mystery before he loses the books, his life, or even his soul? The Club Dumas is one of those rare novels that can make esoteric research interesting. Corso’s investigations into the history of Alexandre Dumas and the trade of bookbinding and bookselling is never dull. The studies of The Nine Doors is enhanced by the inclusion of images of the nine woodcuts of the book, which supposedly contain the Devil’s incantation, as well as tables illustrating Corso’s work. Image of the 7th gate, from the novel. The novel does a wonderful job of conveying a sense of dread, aided by the premise of an evil book of power. Such books have a long history in horror fiction, including the Necronomicon invented by H.P. Lovecraft and The King in Yellow conceived by Robert W. Chambers. Both books, like The Nine Doors, are reputed to possess forbidden wisdom but to inflict a toll on the reader’s sanity and soul. A forbidden book is a wonderful vehicle used by Pérez-Reverte to explore a larger theme of how we impart meaning into works of art which are personal to us and not necessarily inherent in the art itself. This idea becomes integral to the plot and its quite clever denouement. I’ve been reading more mystery novels recently, thanks to my writing introductions for the books of John Blackburn. One thing that has occurred to me in reading such works is how much the writing of good mysteries involve lateral thinking: an indirect and creative approach to problem solving. Lots of lateral thinking puzzles exist, and there are books on such puzzles (I have a few on the shelf). In my experience, the solution of such lateral thinking puzzles involves discarding one of the implicit assumptions made in the puzzle’s introduction. The 1996 movie Scream provides a great example of this: discovering the identity of the murderer is impossible without throwing out an assumption inherent in slasher films that most viewers will automatically make. 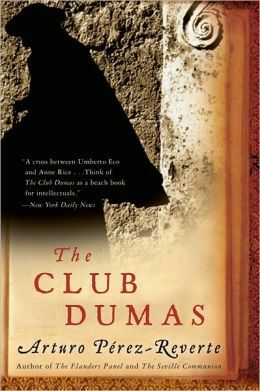 The Club Dumas was also written by Pérez-Reverte “thinking outside the box,” so to speak. The movie adaptation, The Ninth Gate, drops most of the subtlety of the novel and turns it into an almost straightforward story of a Satanic cult. As I noted in the introduction, it is not a terrible movie, but it is really a shadow of the book that inspired it. Apparently most viewers agreed: the movie received mediocre reviews and had a similar lackluster performance in the box office, in spite of its lead star and famous director. This entry was posted in Horror, Mystery/thriller. Bookmark the permalink. The Three Guardsmen was the original title of The Three Musketeers in the US release, at least according to an old Godey’s Lady’s Book from the 1860s I have lying around. I guess they figured no one knew what a musketeer was. Ooh, I kinda liked “The Ninth Gate.” I’m intrigued by this mysterious better book! Perhaps, like Johnny Depp, I should hunt it down in dusty old bookstores. And, like you, I have many, many unread books on my bookshelves. And others I’ve read more than once. That’s okay. It’s good to have a library with some surprises left in it. Ha! Perhaps it’s disappointing to say, but it is probably available at your neighborhood chain store. Very true! There’s oodles of books on my shelf that I’ve likely forgotten exist — will be a pleasant surprise to “discover” them again. Somehow, the presence of all those unread books in my library doesn’t stop me from buying new ones! It’s not even a factor in my decision to acquire new reading material! Also: I love that the author includes the illustrations of the woodcuts from the book-within-a-book! Love it! Did you notice if they used the exact same images in the movie? I believe that the images from the book are the same ones that are used in the movie. There is much more detail about the meaning of the images in the book, though. I read this book recently, too. (I also read all the Musketeers books around the same time.) This novel is beyond great. You are right that the film is okay, but nothing approaching the masterpiece that is the novel it is based on.